When Catwoman comes across this little feline she is in luck. Finding Midnight gives Catwoman nine lives. 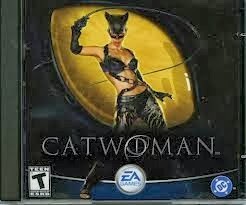 To enable cheats for CATWOMAN, locate "general.vol" file which is in "CATWOMAN\DATA"
folder. FIRST OF ALL MAKE A BACKUP OF "GENERAL.VOL"
Now open the file with your favorite hex editor. 1.Go to offset 00003112 and replace "4646" with "6E20". This will enable DEBUG_CHEATS. 2.Go to offset 00003158 and replace "4646" with "6E20". This will enable DEBUG_TEXTS. 4.Go to offset 000031E3 and replace "4646" with "6E20". This will enable LEVEL_SELECT. 5.That's all. While you play the game press "esc". Now you access many debug cheats. Use pose key to change ON and OFF condition. "DeviceList.cfm" locates in CATWOMAN folder. 1.Open DeviceList.cfm file with notepad. "Card 00001002-00005144 RADEON 7200 SERIES"
3.Now using "cut" command cut the row corresponding to your graphic card. 5.Save the file from file menu. That's all. Now u can play the game with minimum effects. right time then when your up there go straight and the screen will change.